Stonehaven Open Air Swimming Pool'Team GB Winter Olympian Ben Kilner (pictured) cut the ribbon opening the pool for this year. The Art Deco venue was created in 1934 and is Britain's only Olympic-size, heated seawater, open-air pool. ''� Andy Thompson Photography / ATIMAGES ''No use without payment. A special visitor swapped his snowboard for swim shorts as he got the new season underway at Stonehaven’s unique swimming pool. This year’s season, the pool’s 82nd, of the Stonehaven Open Air Pool was officially opened by Team GB Winter Olympian at both Sochi and Vancouver and current British Snowboard half-pipe champion Ben Kilner. 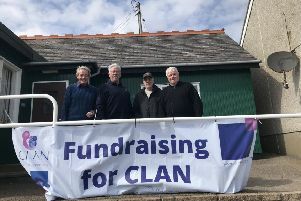 The opening took place at 11am on Saturday, May 28 after months of work by the Friends of the Pool, in partnership with Aberdeenshire Council. Team GB athlete Ben Kilner said: “As a snowboarder, opening a swimming pool will be a first for me. Chairman for the Friends of the Pool, Pete Hill, thinks having a figure of that stature will raise its profile. He said: “We are particularly delighted to welcome an Olympic athlete to officially open the pool for the 2016 season. “Ben represents an age group which tends not to swim in the pool. Kids, parents and grandparents are great supporters of the pool but there’s a big gap between teens and parents who seem to forget we exist. The pool will be open daily until Sunday, September 4, when it closes for the season.